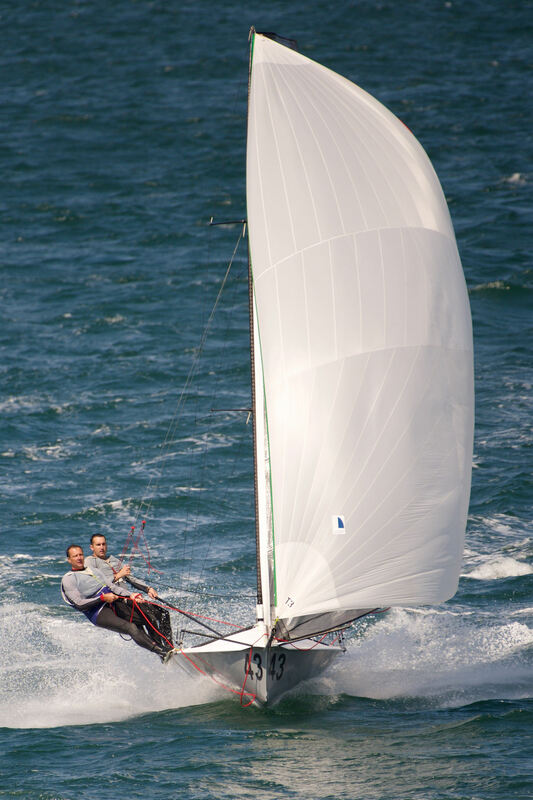 Sydney Sailmakers (Nicholas Press and Andrew Hay) took a dominant victory in the 12ft Skiff Port Jackson Championship. 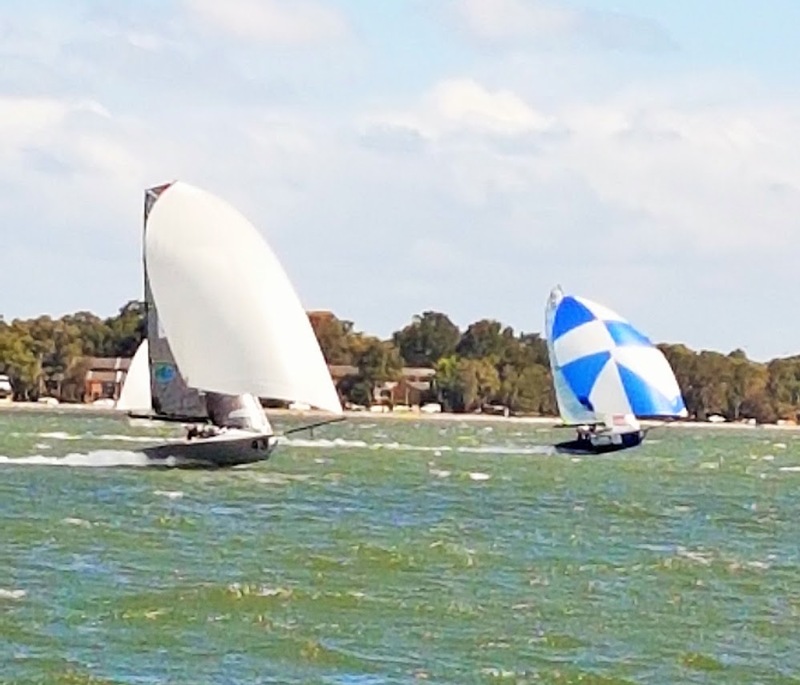 The Sydney Flying Squadron hosted the championship in beautiful 3rd rig conditions. Arrogant Frog (Peter Hill & Steven Hill) from Abbotsford 12ft Skiff sailing club won the start with a beautiful port hander. Geotherm (Brett Hobson & Billy Lusty) was the best of the rest leading the fleet the Bradleys head the first time. After crossing tacks up the first work Sydney Sailmakers lead narrowly from Geotherm with Terms & Conditions (Brad Phillips & Tim Barraclough) roughing in 3rd. After manoeuvring through a tricky bear away Terms & Conditions hit the tide with the crew knocking the skipper clean off the skiff! Once upright the boys sailed a great race to work their way back into 3rd place. 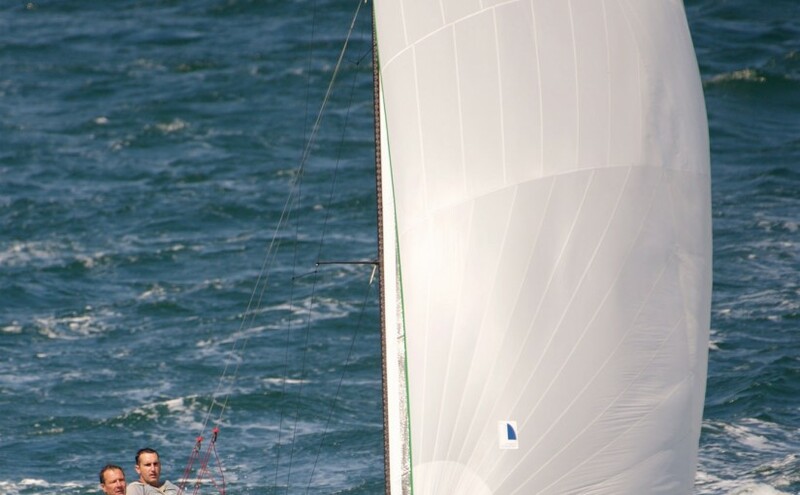 Sydney Sailmakers extended the lead around Shark Island down to Clarke and on the long work up to the Beashel Bouy. Geotherm kept pushing all day breaking away to the Eastern side of the Harbour in an attempt to close the gap, but wasn’t able to reel the lead Skiff in. The fight for 4th and 5th raged all day between The Bird (Jamie McCrudden & Glen Farquar) and Lincoln Crowne (Jonathon Temple & Richard Jones). Jamie McCrudden showing great skills as a Rookie skipper to hold and the experienced campaigners aboard Lincoln Crowne for most of the race. The Bird final succumbed to the pressure down the final run but managed to come home equal first of Handicap for the day. This entry was posted in News, Race Reports on March 21, 2017 by skiffed_2.